Arjun Kapoor’s sister Anshula Kapoor recently suffered a migraine attack following which she was rushed to a hospital in Mumbai. The actor who was busy shooting for his upcoming film India’s Most Wanted in Nepal, rushed to the hospital in Mumbai to be there for his ailing sister. However, the star kid is now discharged from the hospital and is doing better. Arjun Kapoor had to rush back to Mumbai as sister Anshula Kapoor fell sick. Arjun Kapoor realized the importance of family in his life. 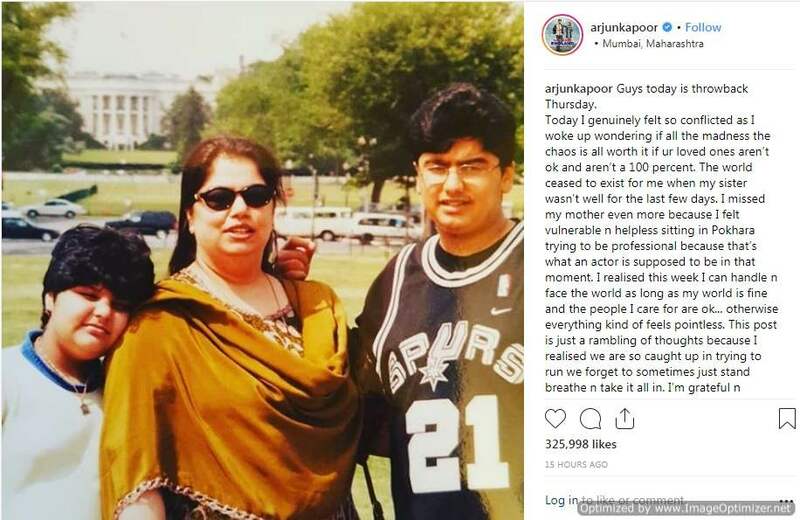 The actor posted a major throwback picture with his mother, Mona Kapoor and sister and wrote a heartfelt message. We all know that Arjun Kapoor is extremely attached to sister Anshula Kapoor and time and again, the actor shares posts with his sister on social media. The actor posted an emotional note for his sister on social media and the post will warm your heart. And here’s wishing Anshula Kapoor a speedy recovery!